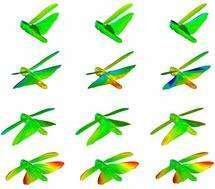 (PhysOrg.com) -- Researchers are one step closer to creating a micro-aircraft that flies with the manoeuvrability and energy efficiency of an insect after decoding the aerodynamic secrets of insect flight. 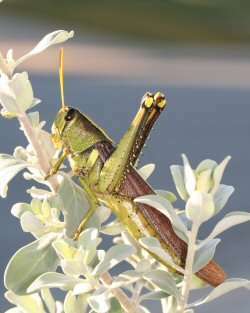 Dr John Young, from the University of New South Wales (UNSW) in Australia, and a team of animal flight researchers from Oxford University's Department of Zoology, used high-speed digital video cameras to film locusts in action in a wind tunnel, capturing how the shape of a locust's wing changes in flight. They used that information to create a computer model which recreates the airflow and thrust generated by the complex flapping movement. The breakthrough result, published in the journal Science this week, means engineers understand for the first time the aerodynamic secrets of one of Nature's most efficient flyers - information vital to the creation of miniature robot flyers for use in situations such as search and rescue, military applications and inspecting hazardous environments. "The so-called 'bumblebee paradox' claiming that insects defy the laws of aerodynamics, is dead. Modern aerodynamics really can accurately model insect flight," said Dr Young, a lecturer in the School of Aerospace, Civil and Mechanical Engineering at the Australian Defence Force Academy (UNSW@ADFA). "Biological systems have been optimised through evolutionary pressures over millions of years, and offer many examples of performance that far outstrips what we can achieve artificially. The three models of the locust's wings, with the fully accurate model on the left and the two simplified models in the middle and on the right. "An insect's delicately structured wings, with their twists and curves, and ridged and wrinkled surfaces, are about as far away as you can get from the streamlined wing of an aircraft," Dr Young said. "Until very recently it hasn't been possible to measure the actual shape of an insect's wings in flight - partly because their wings flap so fast, and partly because their shape is so complicated. "Locusts are an interesting insect for engineers to study because of their ability to fly extremely long distances on very limited energy reserves." Once the computer model of the locust wing movement was perfected, the researchers ran modified simulations to find out why the wing structure was so complex. In one test they removed the wrinkles and curves but left the twist, while in the second test they replaced the wings with rigid flat plates. The results showed that the simplified models produced lift but were much less efficient, requiring much more power for flight. "The message for engineers working to build insect-like micro-air vehicles is that the high lift of insect wings may be relatively easy to achieve, but that if the aim is to achieve efficiency of the sort that enables inter-continental flight in locusts, then the details of deforming wing design are critical," Dr Young said.